It wasn’t until our first outdoor fashion show, Summer of 2011, that I realized the importance of getting vintage clothes off hangers and onto real people. For our first show, we teamed up with our business neighbors, Beigeblond Salon. Brett and Katie did a fabulous job with hair and make-up while Patrick and I dressed and accessorized the models, 12 to be exact. Many of these models were baristas at a cafe/bistro I previously managed and others came from our local community. This first fashion extravaganza started my fashion show journey and love for the runway. Since that warm August day, Most Everything Vintage has co-created Couve Couture Fashion Show with three shows under our belt. 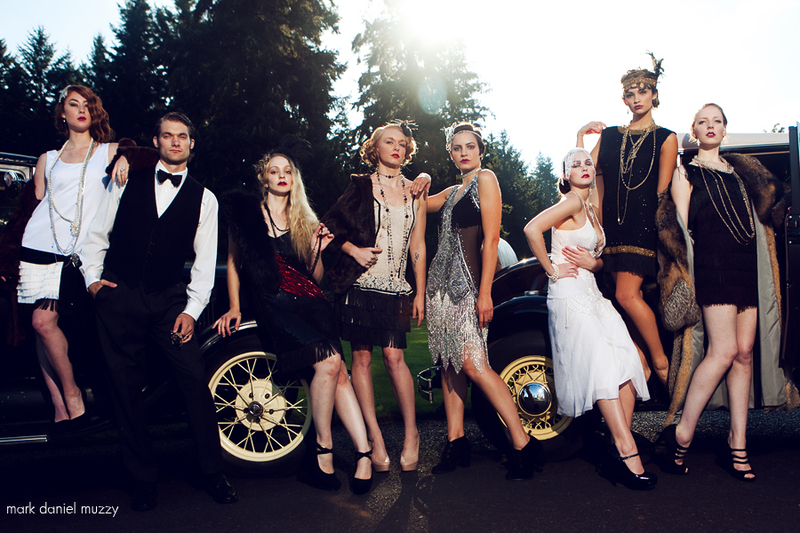 I have also been a part of a vintage themed shoot where I provided my fascinator and hat creations (above picture) and accessories, The Kiggins 1930’s themed shoot, Frankenstein themed shoot, 60’s themed shoot and Spirit of Fall shoot. The last 16 months has been incredible busy as I have coordinated 4 shoots for our shop; Mad about Plaid, Animalistic Whimsy, Nesting and Escape to the 20’s. The last three shoots were extra fun as I modified vintage, created accessories and animal masks. On occasion I like to pull out my camera and spend a couple of hours with a model as I research my decades of fashion. I was thankful to have a beautiful neighbor with a 24 inch waist for a year. She would often try on the clothes before modification so that I could get before and after shots and to just see if the article of clothing was worthy of the changes. On one occasion I started to pull out 40’s dresses and hats from my ‘vault’ and was dying to see them on a real person. One day later Jacqueline and I were at Esther Short Park for 2 hours going back 70 years in fashion. A great day! I am starting to plan my next shoot to prepare for the next Couve Couture Fashion Show this April ’14. I enjoyed diving into the 20’s and have decided to move on to the 30’s. The shoot will most likely be in March…. I have a lot of sewing and creating to do in the weeks ahead. These shoots have been possible due to the efforts of so many creative people around me. Couldn’t have done these without the photographic talents of Mark Daniel Muzzy, Leslie Carpenter of May Faith Photography, Tami Jean of Artistic Cliques, Annie Gould, Ashley Ward, Julien Nelson, Anni Becker, and Chelsea Smith of Urban Bay Photography. To help in the beautification one needs hair and make-up artists. These ladies are incredible! Ashley Rauch ~ Ashley Cheri Stylist, Kandi Smith ~ KSNMakeup and Sarah Adams at Studio 77. Can’t forget my extra hands and assistants: Chelsea, Julie, Anna and Tony. And for all the beautiful models who bring my vintage clothes to life…. Hi Nikki! Good to officially meet you. My name is Alisa and I am the owner of Most Everything Vintage… the one who sold you the turtle:) So glad you like our little shop. Welcome to the area. You are going to love it here. I would love to see your portfolio. I have 5 more shoots scheduled for 2016 but most of my female models have already been placed. Almost all my models are from my customer base. I am also co-producer of Couve Couture Fashion Show with our next show being Spring 2017. We are always looking for runway models for that show. Feel free to stop by and chat anytime. I am generally there Wed, Fri and Saturday.